Registered under the Kyoto Protocol’s clean development mechanism (CDM), construction of the 28.84 MW Barro Blanco hydroelectric project on the Tabasara River in the Chiriqui Province of Panama has been contested from the get-go by Panama’s indigenous Ngäbe-Bugle population (a tribe of about 200,000 living around the basin of the river) and domestic and international environmentalists. Panama’s National Environmental Authority (ANAM) suspended the 5-10 % construction remaining on the project earlier this year over non-compliance with the country’s mandatory Environmental Impact Assessment (the project’s second suspension—the first occurred in March 2012 after three protesters were killed during confrontations with police). Meanwhile, a report published in May by the complaints mechanism of the Dutch Finance Company for Development (FMO)—one of Barro Blanco’s major foreign investors—found the bank had failed its own due diligence to assess the social and environmental risks before approving a US$50 million loan to Genisa, the dam’s developer. 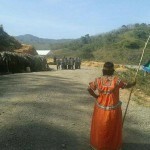 The company’s failure to seek the free, informed, and prior consent of the indigenous communities living on the banks of the Tabasara river violates CDM rules and “casts serious doubt on the CDM’s ability to ensure respect for human rights under international law.” A procedure adopted by the CDM board allows the host country to withdraw approval or authorization for CDM projects—a move that appears to deflect responsibility and one that leaves the fate of Barro Blanco in the hands of the government of Panama, which has vowed to complete the project. That work, however, may be fulfilled by another development company other than Genisa. Flooding of the dam’s reservoir, the last stage of the project’s completion process, depends on a final agreement between all parties.